Nothing beats the patented StowAway for stylish serving needs, easy set up and compact storage. 304 stainless steel work surfaces surrounded by heavy gauge black vinyl clad aluminum exterior. Stainless steel 24" ice bin holds 95 lbs. of ice. Includes drain and petcock valve. 1. 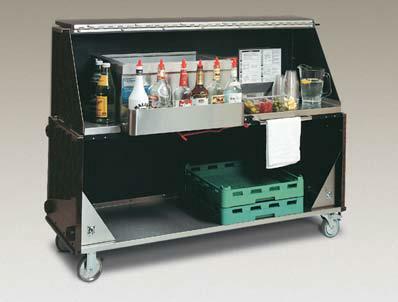 Roll the Stow-Away Bar to the set-up location. 2. Open lower hinged panel out and up. 3. Pull handle up.Latches engage when you reach the open position. 4. Place speed rail in serving position. 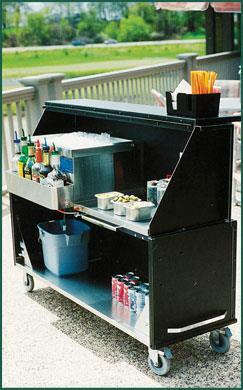 Add ice, drinks, glasses and you're ready to serve. * Please call us for any questions on our portable bar lacrosse stow away rentals in Fort Madison IA, serving Southeastern Iowa and Western Illinois.